RIO DE JANEIRO, BRAZIL – As a country that includes the largest population of Catholics in the world, it is no surprise that Rio boasts an impressive number of churches. Whether you’re an architecture junkie, spiritual pilgrim, or history buff, there are sure to be a few that will catch your eye and leave you in awe. The Catedral de São Sebastião do Rio de Janeiro, photo by Wolfswissen/Wikimedia Creative Commons License. The distinctive Catedral de São Sebastião do Rio de Janeiro is sure to impress. 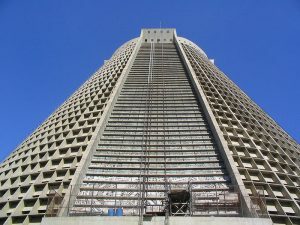 Known also as Catedral Metropolitana do Rio de Janeiro, the young Cathedral was completed in 1979 after 12 years of construction. It stands eighty meters high with a diameter of 106 meters and can accommodate up to 20,000 people. Located in Centro, the Cathedral is oftentimes considered to be one of the most magnificent examples of artistic architecture in Brazil. Architect Edgar de Oliveira based the design on Mayan pyramids in the Yucatan and gave the structure a conical shape. It is dedicated to Saint Sebastian, the patron saint of Rio, and houses the seat of the archbishop of the city. Four massive and colorful stained glass windows enclose the church and stream in natural light. The basement houses the Museu de Arte Sacra (the Museum of Sacred Art), showcasing various historical and religious items. It’s impossible to miss the inimitable Cathedral in the Centro skyline, especially at night when it’s illuminated with color. Igreja de Nossa Senhora da Candelária (Our Lady of Candelária), photo by Mari S. Teixeira. 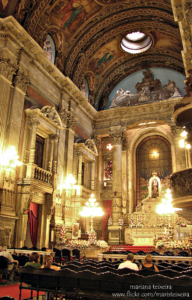 Igreja de Nossa Senhora da Candelária (Our Lady of Candelária), an infamous church situated in Centro, is stamped in the mind of people as a site of beauty and horror. Legend has it that Spaniards aboard a ship named Candelária survived a torrential storm and vowed to build a chapel in gratitude. After years of work, as well as a major renovation, the small chapel turned enormous Cathedral was inaugurated in 1811. Inside, the stunning church contains Italian marble, stained glass windows and bronze pulpits. Six panels depicting the history of the church adorn the roof, and the sculpted bronze doors were proudly exhibited at the 1889 World’s Fair in Paris. The baroque styled Cathedral Igreja São Francisco da Penitencia is located in Centro next door to Convento de San Antonio. Constructed in 1726, the elaborate church is divided into three sections with separate entrances and roofs. The outer facade of the church stands nondescript, yet the inner decor conveys a different story. Murals line the walls and gold covers almost every surface. The roof depicts the story of St. Francis receiving stigmata, and a statue of Santo Antonio is a popular devotee for Cariocas in search of a spouse. The Igreja de Nossa Senhora da Glória do Outeiro sits atop the Ladeira da Glória with a view of Parque do Flamengo and the marina. The Church was said to revive hope for sailors and ships sailing into the bay as it stands tall with a single tower and limestone doorway. Completed in 1739, it has an octagonal shape, an intricately carved altar and elegant Portuguese tiles. Numerous other churches exist along the streets of Rio, with a mix of different ages and styles. Services provided vary – Benedictine monks sing Gregorian chants every Sunday at the Mosteiro de São Bento, and Nossa Senhora da Misericórdia offers services in English – ensuring that there is something for everyone, tourist and Carioca alike.